Don't forget the 3/4 cup of chicken stock added to the pan as it goes into the oven. Yumish! I've never seen such beautiful brussel sprouts. I ate a lot of them in Afghanistan, but somehow I don't think they tasted the same. 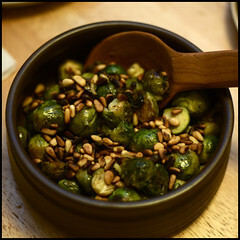 I LOVE brussel sprouts, but have never had them with pine nuts . . . or roasted. Definitely going to have to try that. It looks delicious. Gorgeous picture!! I also love Brussels (or brussels) sprouts, so I had to post this. I thought they were "brussel" sprouts until I saw the word in a cookbook about 4 years ago. I was shocked that I had missed the "s" my entire life. They were grown in Belgium 700 years ago. I like to roast them, but I also often saute them in a skillet with loads of garlic. "Brussels"!! Who knew? not me! that's an excellent fact-of-the-day. and thanks for complements on the photo. a perk of dating a photographer.